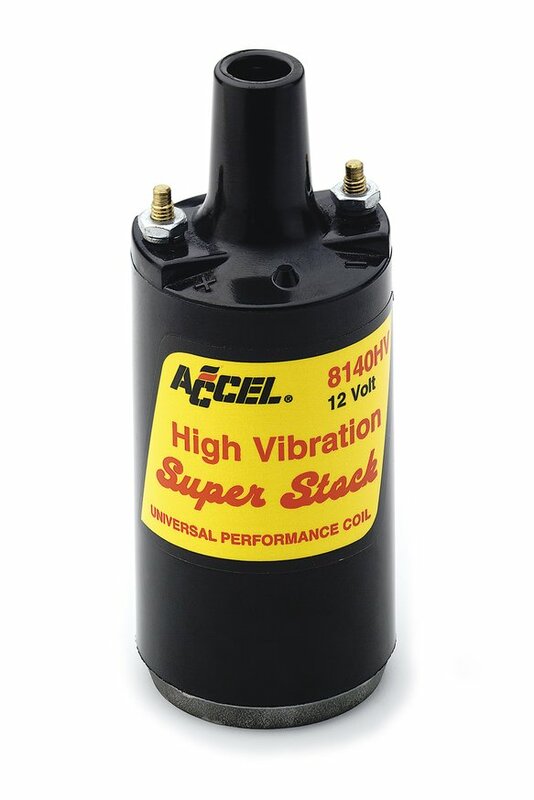 Limited To Stock On Hand - This high vibration ACCEL Super Stock canister coil has maximum voltage of 45,000 volts. Excellent choice for high performance, heavy duty and off-road use. Canister style can coil is completely encapsulated in high temperature epoxy to protect the windings and internal connections from the harsh vibration and impacts that could destroy a typical oil filled canister style can coil. Engineered with special low resistance, high turns ratio windings to produce higher energy output with breakerless electronic ignition systems and replacement distributors. For points applications a 0.85 Ohms ballast resistor (part #150001 not included) must be used in conjunction with the vehicles original ballast resistor, if so equipped. Heavy Duty black Alkyd over-molded tower provides "flashover" protection to primary terminals. Can be mounted in any orientation.